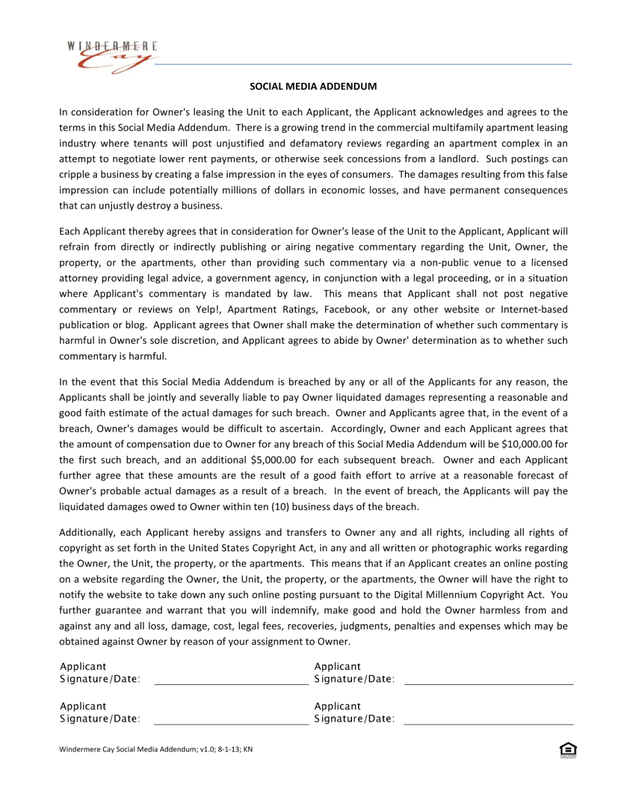 A Florida Property Manager posted the article below (Huffington Post) about an Apartment complex that required tenants to sign a "Social Media Addendum." They might be the landlords from hell, but you're not allowed to complain about them. "Applicant will refrain from directly or indirectly publishing or airing negative commentary regarding the Unit, Owner, property or the apartments," the addendum reads. "This means that Applicant shall not post negative commentary or reviews on Yelp!, Apartment Ratings, Facebook, or any other website or Internet-based publication or blog." Before Tuesday, few people had reviewed Windermere Cay. By the end of the day, however, a lot of people had reviewed the place. Things are not going well for the apartment complex online. On Yelp, reviews have been flooding in from people who are either disgusted by the contract or think the whole thing is a joke. Most of them said they weren't tenants. One of Windermere's five-star reviews, for instance, comes from "Adolf H." who hailed the complex for having "my kind of management." Other reviews on that site and ApartmentRatings.com were similar. Ars Technica spoke to one resident of the five-building complex, who wished to remain anonymous. He called the addendum "ridiculous" and said he asked management to remove it from his lease, but didn't receive a response. "If I took a photo of people in my apartment, they would own it," the tenant said. "This addendum was put in place by a previous general partner for the community following a series of false reviews. The current general partner and property management do not support the continued use of this addendum and have voided it for all residents." Regardless, law experts have told multiple publications that the addendum wouldn't hold up in court. Even so, it seems that trying to control tenants' thoughts on your business is a lot harder than trying to make them happy in the first place. Obviously this was not a good idea. I take no issue to anyone posting reviews. What I take issue with is that those allowing these reviews do nothing to verify them. I have said that internet reviews are today's bathroom wall writing. I encourage you to review my blog post Internet Reviews are the Bathroom Wall Writings of the Past. In that blog post I explain why I compare internet reviews to mindless writings on bathroom walls. For one, we have reviews from people claiming to be FRPM tenants. We have no such name in our system. So are these reviewers mistaking us for another company, or are they a competitor trying to discredit us, or are they an actual tenant using an alias? Companies like Yelp and Google have to put forth efforts to not allow all three of those scenarios and honestly, I think they are negligent in not doing so. People should not be allowed to post using an alias because it allows for untrue or embellished stories that no one can confirm or deny. I am convinced, these companies created these reviews not because they believe they actually help consumers, but because they require them to be a user with a username and password, they capture more customers to pay for their services. FRPM has looked at an addendum that would allow us to post photos, videos and recordings, such as the recording below, to publicly dispute negative reviews. But we never implemented it because when we looked at our bad reviews, less than 5% were of names of actual tenants or described a situation that we could actually substantiate. By the way, we beeped out the name and address of the tenant that left us that voicemail. Imagine if that tenant posted an untrue and negative review. I so much would like to respond with that recording of her so that everyone knew we were dealing with a psycho. Maybe I blame Al Gore for inventing the internet.